Well, here we are at the end of another year and I’ve been thinking of all I’ve done this year. It has, by far, been the most productive year since I’ve started any of my crafts. I would like to show off my accomplishments by the categories I create in. Now on to my crochet projects. This was the year I found Afya Ibomu of Get Your Crochet On. This was actually the only thing I could figure out on my own as a child but didn’t know how to put it all together so now you can link to my crochet hats from Ms. Ibomu. Crochet projects ’08 I look forward to adding some crocheted garments to my wardrobe in ’09. I don’t talk about this craft often but it’s the one that catapolted me into the world of blogging and opened the way to sewing and knitting. 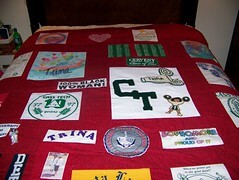 So without further ado here’s my Quilting ’08 project I actually added every quilt I’ve done since starting this craft. 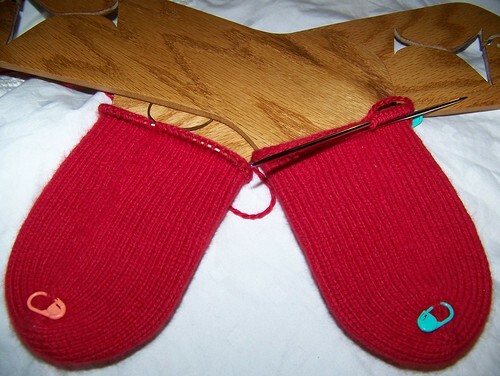 How could I list my projects without including my knitting. Here are my knitting projects for ’08 there are more projects somewhere around my Flickr so take a cruise. I’m looking forward to managing my time so that all my crafts get some attention and my completed project list is longer than in ’08. In my knitting I would like to try lace knitting and actually have a few sweaters for myself when it’s all said and done. I would also like to work on having a better fit as the fit of my first sweater my Green Gable is not exactly what it should be. In sewing I want to learn how to fit my shape better and improve my lining skills as it is my goal to make an outer garment. Sewing should bring about more confidence in projects I tackle and a fabulously flattering wardrobe. In crochet I hope to create some garments. Honestly, my biggest desire is to write a pattern and actually have it work. I have always created for others and in 2009 I really want to increase my wardrobe with items I created. I will be keeping a running count of how much yarn I bust through in 2009, I will do more to give to charity through my crafts. I would like to give locally as I feel the need to help my community as we are facing a devastating job loss market here in my region of Ohio. There will be a monthly review of the podcasts I listen to as they too cover every craft I do. 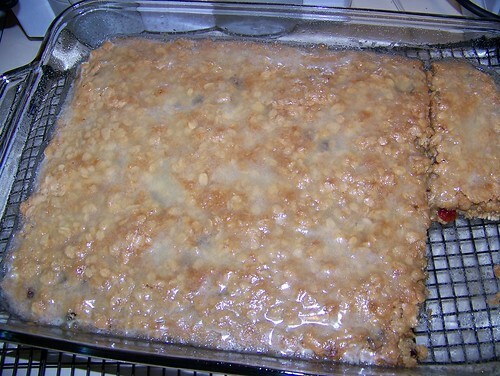 It will be the last Saturday of every month beginning Jan. 2009. 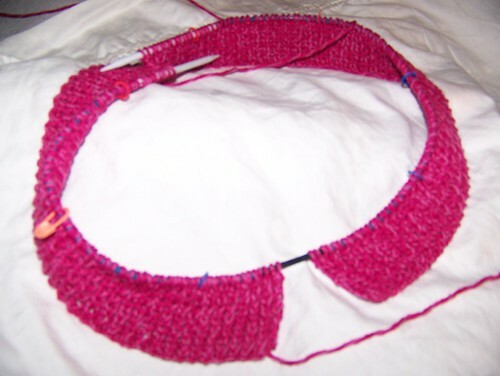 I will also try to feature a new pattern from the many pattern books I have not so much that they will be new to you but we can take a look at how it comes together. I would also love to review different products and books that I have as a way of pushing myself to keep busy and productive. Here’s hoping that you’ve had a wonderful year of creating and learning and growing as an artist and in 2009 I look forward to what the year will bring to all of us in our nature to share the warmth of creating something from a beautiful yarn, fabric, beads, embroidery as only you can. 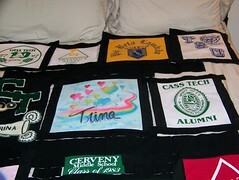 This quilt is being created for a loving couple who was blessed to finally welcome a new additon to their family. I’m branching out from my regular quilting style to make this one “on point” I think that’s the correct term. We’ll see how it comes out. I noticed last night that my N is upside down so I’ll be fixing that today. 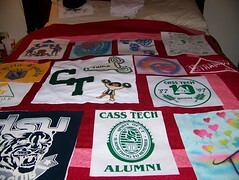 This is the T-shirt quilt I’ve been working on since May and it has been challenging but rewarding all at the same time. I really want the customer to like it and I think we’re finally at a point where I have the okay to quilt. The thing I discovered on Sunday evening is that I can’t get this to fit in my machine for machine quilting so this will be done by hand but I like that and haven’t done that in a long time so it will be good. If there are any pointers out there please feel free to contact me. I can use the help as this medium of working with t-shirts and sweatshirts especially are a bit more cumbersome than what I’m used to. I have finally learned to insert pics into my post using Flickr.com and I’m so happy as I know for myself that having pics inserted in your post draws more people to your blog and I love having people leave comments and advice. 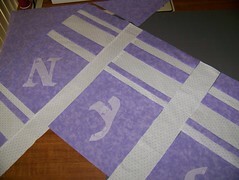 I’m trying to have Nyla’s quilt completed within the next two weeks and hopefully that will work out the way I plan. 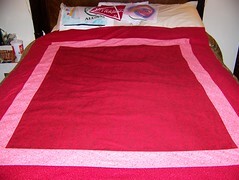 Okay I’m off to get back to quilting and all the other crafts I have going on. Hope everyone had a Blessed Thanksgiving and I’ll be chatting with you later.